We found out on Valentine’s Day last year that Bailey had cancer. The mass was too big for chemo but the doctor’s felt that it could be surgically removed along with his left kidney. The mass was over two pounds. It took a bit but once he recovered from the surgery, Bailey did really well for the summer months. He was more active than he’d been in years. He put on some weight. I guess things change so gradually sometimes that we didn’t notice and apparently what my wife and I had assumed was him just getting older was actually him getting sick. Giving Bailey his medicines twice a day became a daily reminder that we were getting more time together. Unfortunately, the surgery and follow up chemo only delayed things. By September we started to have problems getting him to eat and one of our regular oncology check ups found three new masses were growing on his remaining kidney and his liver. We struggled to get him to eat trying as many things as we could think of, but I knew by the beginning of November that he was just tired, and I wasn’t surprised when the oncologist told me we were out of treatment options. He had stopped eating anything but table scraps and was down to 25 pounds, less than he’d weighed coming out of surgery in March, and just over half of the 40 pounds he’d been for most of his life. Bailey passed away at home early in the morning on November 26th. 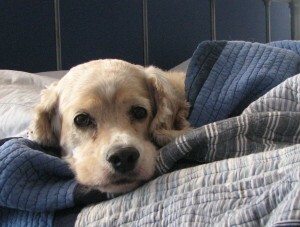 I take some solace that the last few evenings of his life, Bailey and I spent cuddled on the couch. He seemed comfortable and happy. Dogs may be small animals but they leave huge holes in your life when they’re gone. I miss him dearly.